An Honest Review of The J5 Tactical Flashlight – Does It Deserve All The Hype? Flashlights that are used together with firearms, to help illuminate a target more precisely while improving their aim, are called tactical flashlights. Other features usually include a long battery, water resistance, heatproof, different light beam modes, mountable design or accessories, lightweight, combat grade aluminum body, infrared light beams to name a few. If you are looking at an entry level flashlight, or in this case a simple torch with high lumen power, the J5 tactical flashlight is an excellent purchase. Tech specs for this ultra bright EDC torch are simple and straightforward. It would be better to look at them in light of their performance. The J5 tactical flashlights USP is it runs on a single AA sized battery to produce 250 lumens beam. Most other tactical flashlights employ AAA batteries in pairs. The smaller battery area makes it much more compact in build than the other batteries in its class. At 4.2 inches, it fits in your palm and produces a supercharged LED beam. Another USP of this compact devil its throw length. You can beam up to two football fields according to an official description. Other technical specifications include 3 modes of beam. Dim, bright and flash mode. The bright mode works really well in illuminating tiny details in a dark room. The dim mode, on the other hand, leaves much to be desired for. Fairly bright beam but not 250 lumens as advertised. Sturdy make but parts have been screwed together without much care. Lens, rings and other threaded parts keep coming loose. It’s more of an ‘Everyday Carry’(EDC) light than a tactical light unlike what the product specs say. Apart from overhyped marketing vs the reality of the product, not much to complain here. It’s a good idea to buy these in pairs to keep a couple of them handy at different places. Makes for perfect gifting option for sparse usage. Not too bright so kids can handle this. Can be left in glove compartments, handbags, office desks for emergency usage. This isn’t the light for you if you go mountain biking at night, patrol areas for security reasons, frequent ill-lit areas for work purposes, are a flashlight enthusiast all gung-ho about programming features, flashy LCD displays, special modes, so on and so forth. Those are in different flashlight classes. Although this one claims to be a tactical light, the only feature that would make it borderline tactical is the crowned bezel that’s supposed to work in tandem with the strobe mode. It would be idiotic to assume this to be a sharp-edged finish for self-defense, it’s designed so as to set it down without harming the lens. Very minutely helpful for any kind of tactical usage. It’s also unfair to compare it to other EDC lights that cost 3 to 4 times more than this one. 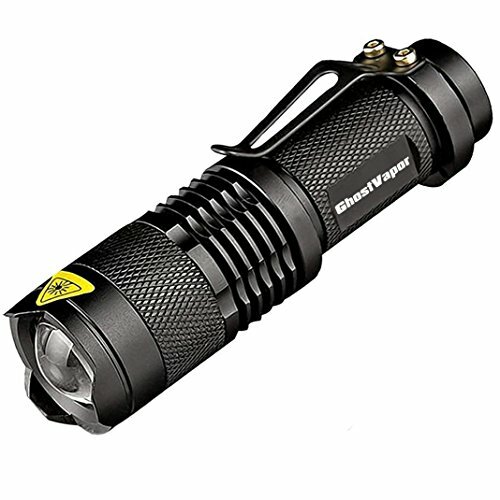 It is designed for regular use by the average person who just wants a very lightweight torch that can provide a blazing beam, double up as something sturdy to use in defence, seems fancy with the strobe, can be tossed in a backpack or a sling bag even, requires no fuss single AA batteries that are easily available and replaceable, and function for a good few months, at the end of which they can pay for a similar flashlight with flashy features that costs them next to nothing. You can experiment with different AA batteries but be mindful of any serious injuries resulting from battery leakage, excessive heating, or exploding parts. While similar flashlights are available for $3 across the web, they have only one beam mode. So any comparisons with those models are moot. And yes, these are also made in China but have better reviews than their cheaper counterparts. Drawing comparisons with an MT10C, Olight S1, Thrunites and Nitecores is unfair to the price point as well as the target audience. The point here isn’t the intensity of the beam. It takes 80 lumens power to startle and surprise an attacker – whether four-legged or two-legged. Even though it doesn’t deliver the 250 lumens, it’s still much brighter than the average torch and does serve the purpose.